Info Jump at the perfect time! A well-timed jump gives a speed boost! Compete to get to the finish line in the fastest time by jumping over a series of hurdles with good timing. 110m Hurdles is an Event that appears in the Nintendo 3DS version of Mario & Sonic at the Rio 2016 Olympic Games. The objective of the event is to run the 110m track and jump the hurdles in the fastest time, with the starting world record being 12.80 and the starting Olympic Record being 12.91. The playable characters in this event are Mario, Luigi, Diddy Kong, Sonic, Dr. Eggman, Silver and Mii, with Diddy Kong being unlocked by beating him in 110m Hurdles Plus on the first day of Mario's story in the Road to Rio mode. Toads appear as referees in this event. In the Road to Rio mode, 110m Hurdles appears as the event on day 1 of Mario's story. This event starts with the characters being shown lining up at the starting line. When " Ready?" appears onscreen, the player is able to hold to charge up power and perform a faster start. When "Go!" appears, the player must release to start running, and can perform a Rocket start if they release the button with perfect timing. Once they event has started, the player must repeatedly press to accelerate, with their speed being indicated by the color and type of the trail following them. A white smoke trail indicates a low speed, blue flames indicate faster and orange flames indicate the fastest, with the maximum speed being indicated by the word "MAX" appearing in the flames. 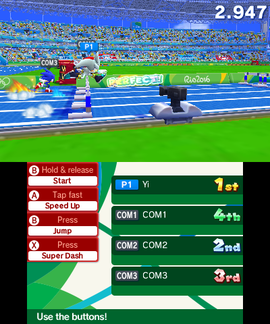 To jump the hurdles, the player can press either or . When the player approaches the hurdles, the jump area appears on the ground with a yellow, orange and red stripe indicating the rating and speed boost the player will receive for jumping the hurdle at that time. Red gives a perfect rating and the largest speed boost, orange gives great and a smaller speed boost, while yellow gives a good rating but no speed boost. Failing to jump in time or at all will give the player a miss and cause their character to knock over the hurdle and lose speed. If the player successfully jumps a hurdle, the jump area will be removed on any subsequent hurdles unless they knock one over, in which case the area will reappear. The player can also perform a Super Dash by pressing at any time during the race, which will cause the character to go much faster for a short period of time without losing speed for going through hurdles, but can only be performed once. As the player approaches the finish line, they can press to lean forward to finish the race slightly faster. Once you perform a jump well, the jump area will disappear next time, so remember its position. Press the B Button near the finish line to lean forward and shave a split second off your time. You can jump with the R Button as well as the B Button. This page was last edited on February 26, 2019, at 18:56.